LACTEEZE CHILDREN’S STRENGTH tablets are specially formulated for infants and children up to 12 years old. 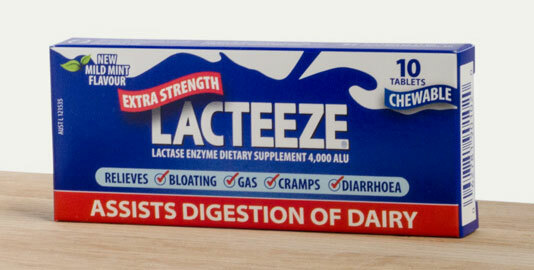 Simply chew or swallow 1-2 Lacteeze Children’s Strength tablets just before consuming dairy foods. Repeat the dose if you continue to eat dairy after one hour. Great strawberry taste kids love! Free from artificial preservatives and colours, egg, gluten, dairy and nuts. Dextrose, microcrystalline cellulose, lactase (3,000 FCC lactase units), calcium stearate, strawberry fruit crystals, citric acid, natural flavours and natural colour. I bought these recently for my 2 year old who is lactose intolerant and they worked brilliantly. It will save us a fortune in having to buy lactose-free products. I was concerned that getting him to take them would be difficult but fortunately he loved the flavour so no problems there. I purchased these for my son, unfortunately he is lactose intolerant and really suffers. It is hard to find products that actually work and not make him miss out on those special treats and not make him feel different about it. Love this product and would recommend to any parent for their child. !